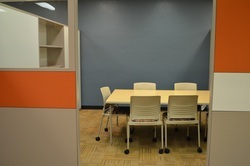 Rooms for use by BGSU students, faculty & staff. Reserve for up to 3 hours per day for your group (2+ people). Reservations will be held for 15 minutes before opening to walk-in users. Online reservations must be made at least 1 day in advance; same day reservations available in person. Review the complete policy document prior to booking. This room provides seating for six around one rectangular table. Electrical outlets & USB ports located on table. Wireless internet connectivity and white boards also available. This room provides seating for four around one table. Electrical outlets, wireless internet connectivity and white boards all available in room. 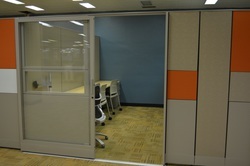 This consultation-type room provides seating for 2 or 3. One computer workstation available on desk. Electrical outlets, wireless internet connectivity and white boards all available in room. Are you in need of a meeting or presentation space? 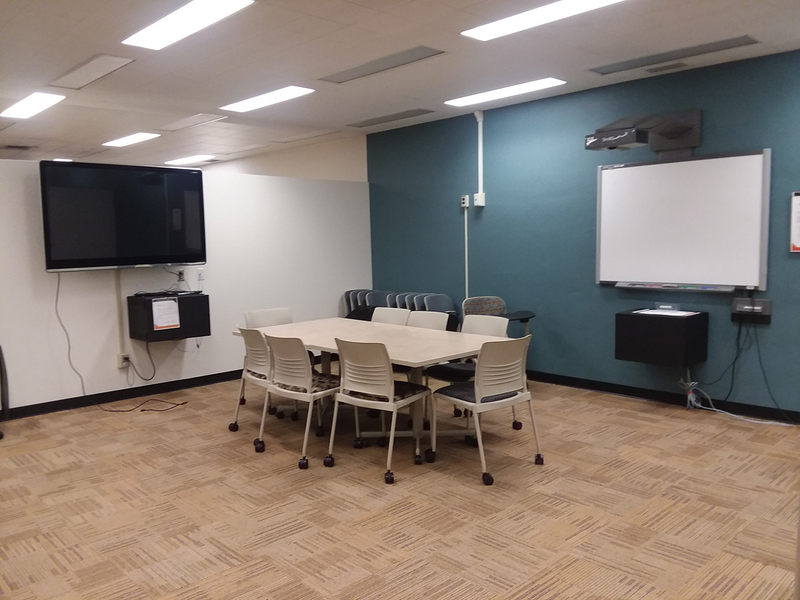 The Learning Commons has a Presentation Area with seating for 8 around a table and an additional 30 chairs for larger groups. The space also has a Smart Board and 60 inch monitor that you can use! *To access the computer technology you will need to checkout keys to the computer cabinets at The Learning Commons front desk located on the first floor of the Jerome Library during our normal business hours. 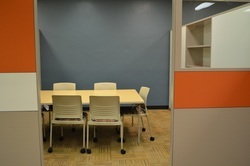 This large group room provides seating (with attached desks) for up to 25 people, a computer and 80 inch TV. 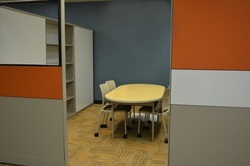 Also contains one movable table, electrical outlets and white boards. Wireless internet access available. This room provides seating for six around one rectangular table. Electrical outlets, wireless internet connectivity and white boards all available in room. This room provides seating for six around one table. Electrical outlets located on table. Wireless internet connectivity and white boards also available.